Evergreen Suite was designed with warmth, comfort and privacy in mind. We are a newly designed suite with a private entrance that comfortably sleeps 2 -3 adults or 2 adults and 2 children. We are walking distance to the Village Green where you will find unique shops & eateries. For those of you who are college bound we are 1.5 miles from Hamilton College and 20 miles from Colgate University. We are located at the "Foothills of the Adirondacks." For your convenience the Suite is equipped with a Keurig coffee brewer, under the counter refrigerator and microwave. Table has leaves to expand for extra room if needed. Our bathroom has a beautiful tile shower and room to place toiletries. Included are eco science soaps, shampoo and conditioner. If you forget Q-tips, toothpaste, make-up remover etc. don't worry, we have it! Parking for two vehicles is available on the premise. 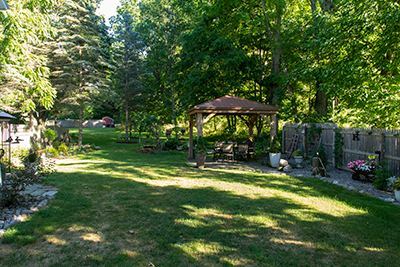 Enjoy the beautiful, spacious back yard with fireplace and patio with table and chairs. We are available when needed either by phone or in person. You will love the quaint village of Clinton and the Hamilton College grounds. We can help you visit some local gems like the Utica Club Brewery, Munson Williams Proctor Arts Institute, the Stanley Performing Arts Center, the Utica Zoo and the renowned Bouckville Antique Show. The Turning Stone Casino is a 15 minute drive, The National Baseball Hall of Fame is a one hour drive, both the National Boxing Hall of Fame and the National Distance Running Hall of Fame are less than 30 minutes away, and last but certainly not least is our brand new Utica Comets hockey team located just north of Clinton in the City of Utica. We are on the bus line and taxis are available, but the close proximity to the Village of Clinton will make walking your favorite choice! As you might guess we are Adirondack enthusiasts. In one hour you can be in the Adirondack Park. Whether you are an active individual and are looking for a great hike or love to sit by the water with a good book you will be enthralled with the mountains and all they have to offer. We will be happy to share details of places to visit when you stay.